Hasselblad Adjustable Flash Shoe for 500c 500cm 500elm. .
Point & Shoot. Securely mounts to the proprietary flash shoe and unlocks with a push button release. 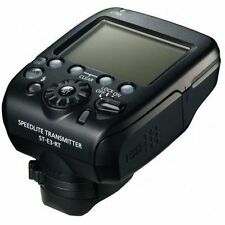 For firing flash only -- Does not transmit TTL or other exposure information. Connects to all standard hot shoes. This adapter is software version M5 not M6 as in the title. sorry for the confusion. 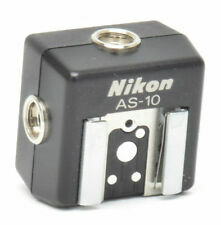 it is not M.
Nikon AS-15 Sync Terminal Adapter (hot shoe to PC). Condition is Used. Shipped with USPS First Class Package. This is a rare flash cord adapter with a male Honeywell screw in pin connection one one side and a male Kodak PC connection on the other. Up for sale at KEH is thisSony ADP-AMA Shoe Adapter, Auto Lock (Multi Interface). Compatibility: Sony Digital. Sunpak Interface Module STD-1D . Condition is Used. Shipped with USPS Priority Mail. Key Features: 1.Compatible with Sony A6300/A6400. 2.Relocates the hot shoe of camera to the right side for allowing LCD touch screen of Sony A6400 tilting 180° up when mounting microphone. 3.Locks firmly via the hot shoe and the shoulder strap hole of camera. 4.Comes with rubber pad on the bottom for protecting the original hot shoe. 5.Features the shoulder strap hole on the right side for mounting strap. 6.Maintains the flashlight of camera access. Compatibility: Sony A6300/A6400 Package Includes: 1 x Cold Shoe Relocation Plate 1 x Hex Spanner 2 x M2.5 Screws Product Dimensions: 94x27x20mm Package Dimensions: 110x130x40mm Net Weight: 12g Package Weight: 22g Material(s): Aluminum Alloy. 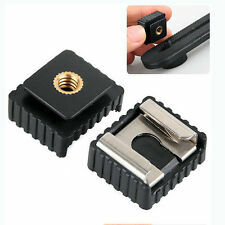 Durable Pro 1/4" Mount Adapter f Tripod Screw To Flash Hot Shoe. It can install YONGNUO CTR-301P Flash Remote Trigger to Flash Shoe Umbrella Holder Stand Bracket. This adapter permits the devices with standard 1/4" screw hole to be installed on flash hot shoe slot.It includes 2 nuts which can be adjusted. This Olympus OM-2n Shoe 4 Is In Very Good Condition. A couple minor cracks but still works fine. Allows you to mount a standard flash unit or other accessory on a tripod, light stand, or bracket which uses a standard 1/4x20 thread, and provides a hot shoe connection on the top. Hot Shoe with 12" Cord and PC Male Connector. The AS-15 is in perfect working condition. Available to use on the studio light and flashgun trigger through PC socket. Suitable for All Sony & Minolta Speedlite Minolta 5600HS(D)/ 3600HS(D)/ 2500D/ 5400HS/ 5400xi/ 5200i. Hot Shoe Converter only, other accessories demo in the picture is not included! Key Features: 1.Accepts any standard shoe-mount devices such as lights, microphones, etc. 2.Connects via two 1/4"-20 screws to prevent twisting. 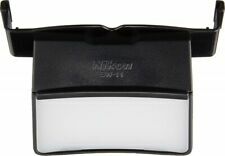 3.Features an anti-off button to prevent sliding. Designer: Bill Wang Co-designers: Daniel Ockeloen Compatibility: Fits any cage/handle/plate with standard 1/4”-20 threaded holes Package Includes: 1 x Cold Shoe Mount 2 x 1/4 Screw 1 x Hex Spanner Product Dimensions: 30x29.4x14mm Package Dimensions: 95x65x28mm Net Weight: 16g Package Weight: 42g Material(s): Aluminum Alloy. This item is aNikon AS-E900 Flash Bracket along with a AS-E900 Adapter and Cord. It has been tested and works fine. All are in excellent condition. They will make a very nice addition for yourself, or a great gift for that special relative or friend. Movo Warranty Policy. If the product has been discontinued, the warranty provider reserves the right to replace it with a model of equivalent quality and function. Movo Photo is your source for high-quality audio and video gear. 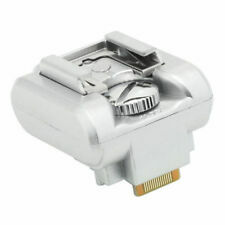 1 X PIXEL TF-334 Hot Shoe Converter for Sony MI Convert to Canon Nikon. TF-334 hot shoe adapter is used for converting new Sony hot shoe to Canon/Nikon. With PC connector, it can trigger flash and studio light with PC port by PC connecting cable. 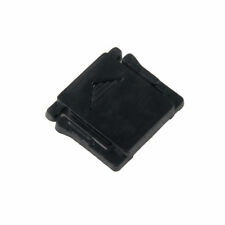 C-N2 flash hot shoe adapter for Canon Nikon D-SLR. Hot Shoe Converter only, other accessories demo in the picture is not included! Features PC sync socket. Provide convenience for photographers. Due to the difference between different monitors, the picture may not reflect the actual color of the item. ▼ High Quality Bracket Flash Shoe Umbrella Holder Type E. ▼ Top flash lamp holder can be accessed by Tripod. ▼ 1/4″ and 3/8″ socket can be changed of the base for tripod or light stand through turning the inside silver stuff. It is used and the pictures show the condition. GENUINE OLYMPUS Hot Shoe Flash Adapter. This item is very clean appearance. We are looking forward to receive your order! The adapter also has an extra PC female outlet. For Model 283. See Photos For Condition. Overall All Very Good Condition. Compatible With: Standard hot shoe flashgun. Features PC sync socket. Hot Shoe Adapter only, other accessories demo in the picture is not included! Quantity: 1 Pc. Set of 2 JSC-8 universal hot shoe adapters by JJC. Features universal single pin (non-TTL) hot shoe top and bottom and female PC and female 1/8”/3.5mm miniphone sockets. This is OEM for the LumoPro LP907. 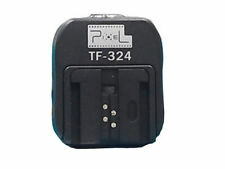 PIXEL TF-324 Hot Shoe Convert Adapter. Available to use on the studio light and flashgun trigger through PC socket. for example Nikon canon ect. 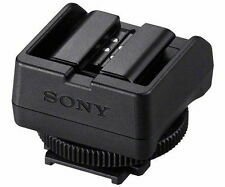 This flash adapter is specially designed for sony flash. Handy 1/4 20 tripod or light stand thread underneath. Unsure of the specific application/s for this, there are other versions of that are identical in appearance but have slightly different designations. Attaches to any 1/4-20 threaded hole. Demo Used 1/4-20 Hot Shoe. There may be flaws like scratches/marks from installation and removal. Product has been tested, and is fully functional. TheFA-300HS Triple-Flash Hot Shoe Adapter Mount fromImpact allows you to mount, sync and fire up to three flashes from this single adapter. If you own an Impact PowerSync DC Radio Slave System or a similar wireless unit, you can fire them all with a single receiver attached to the adapter. Trending at $14.66eBay determines this price through a machine learned model of the product's sale prices within the last 90 days. 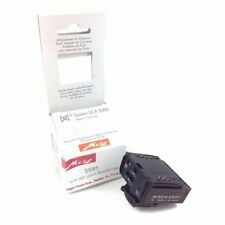 JJC MSA-3 Hot Shoe Screw Adapter x 1. For auxiliary flash, flash trigger or other accessory. Hot shoe to standard 1/4" 20mm Threaded Stud. 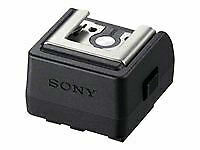 Sony Hot Shoe Adapter FA-HS1AM. Excellent condition. Shipped with USPS First Class Package. This Kodak Magicube Extender is in excellent condition. “EXCELLENT CONDITION.". 80 to 89 percent of original. Shows moderate wear for the age of the item, with the possibility of small dings or blemishes. Glass may have slight blemishes but will not affect picture quality. Converts Sony hot shoe to standard hot shoe. This adapter does not support TTL flash operation. Weight 0.6 oz (18 g). Corporate accounts and large quantity orders can be accommodated. Call for more information. For sale is this Nikon F2 Flash Unit Coupler AS-1 Type 7 for use on F F2 F2S F2SB F2A F2AS SLR's. Good condition. Box is as shown.